!! WINDOWS DOWNLOADABLE VERSION ALSO AVAILABLE !! A co-operative platform game! Coordinate to make jumps without getting too far apart and splitting your horse costume in half. If the browser version doesn't work, try the Windows executable version. No violence or enemies. You can't lose. Just weird horse costumes. Can be played solo if you are feeling up for a challenge! Play with WASD/Arrow keys or with game controllers. Does not need game controllers. ESC to quit game, R to restart level,. 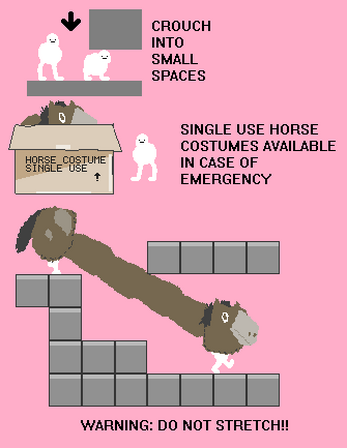 The horse costumes are cute and the platforming works well. Very impressed with the result as it's a 48 hour jam game. Since the players are joined together it could be fitting to go with a shared controller scheme. Left thumbstick + left bumper for 1st player and right thumbstick + right bumper for 2nd player would make it easy for a shared one hand grip and also make it easier to experience it as a single player. Another side effect would be the ability to double the number of players with the given hardware. Not sure about this one but another thing to explore could be to use a tether mechanic so the players are strung together by a force like a spring or rope that doesn't break. This could be used to add an other interesting puzzle mechanic for the levels. The elastic or rope force could be used to swing or carry the other player to another platform below. Another interesting idea would be that depending on the level design, all of the players were strung together to form a long horse and for another level design they were split up into groups of 2 (or 3). Could also be implemented as a modifier in a settings screen. Have you played Piko Parc? I think that style of puzzle arenas would fit the game perfectly. In Piko Parc the levels fit in one screen and you need to figure out what to do as a team to get to get the key and get everyone to the exit. In order to keep everyone involved Piko Park has levels that adapts to the number of players so if there is a gap that needs to be bridged by building a stair of players to bridge the gap the gap is wider if there are more players. Could be overkill but it's a nice feature. One advantage of same screen levels is that you wouldn't need split the screen to add more players and all of the players could cooperate more easily. To test the game's limits I tried starting the game with 10 players using 4 XBox360, 4 virtual DirectInput gamepads (vjoy) and 2 keyboard players. 5 horses were formed but "only" 4 viewports were displayed. Also tried with more than 4 XBox360 controllers but only 4 of them were detected by the game so it's the same scenario as for Defend the Night. Wow thanks!! You guys are really good, you got through it pretty fast haha. I like the editing on your video! Happy you enjoyed the video it was a really fun game and we do wish it was a longer game. It was for a game jam so you could do only so much with it but it is still a really good start if you ever plan to expand the game into something more.